As I shuffled the cards to select this week's Intuitive Tuesday tarot card, I said, "Tell me what messages I need to bring to my readers this week." I selected the Eight of Wands (Reversed) from the Legacy of Divine Tarot by Ciro Marchetti. I selected this card just a couple of months ago. You can check it out by clicking here. 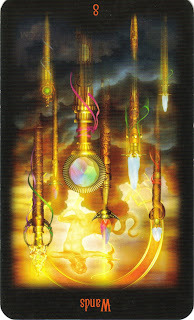 The Eight of Wands (reversed) can indicate anything from further delays to things feeling really chaotic. If you are feeling overwhelmed, be sure not to get caught up in the energy of being busy so much that you waste precious time or delay decisions. It's not time to force things -- and I think you can feel when things are being forced -- but it's also not a time to dilly-dally. If you start to get stuck in the Eight of Wands Reversed energy (feeling delays or squandering energy), go with your gut, pick the path that feels best and move forward. This is a perfect card for me this week as I send my kids back to school. The past two weeks seemed like chaos as we prepared for the first day of school -- buying school supplies, clothes, getting appointments taken care of, etc. I have been getting tons done and I've been busy, but I also feel as though I've gotten nothing done. Perhaps it's a case of mixing up my priorities (what needs to be done vs. what I THINK needs to be done). Since I recently selected the Eight of Wands (Reversed), I pulled another card today (intuitive BONUS) from the Messages of Life deck by Mario Duguay. This card is called, "Truth." These cards are so beautiful and have deep, meaningful messages accompanying the artwork.You can click here to check it out or go to your local (metaphysical) bookstore. The truth is found within me. I listen to this Divine force that comes from my inner self. I discover all the answers I am looking for. I am in harmony with myself and I welcome the love of God, the Power that will guide me towards my fullest shining radiance. Although these two cards seem to have opposite meanings (Eight of Wands = Chaos, and "Truth" = finding stillness and truth within oneself), they actually have a very powerful message for me today: When things feel most chaotic is when it is most important to listen to my truth. If I am to measure my life on the scale of chaos to truth, I have a feeling what is most important is how I perceive where I am...and not so much what is happening at the time. We are the sum total of our reactions -- Things happen in life and it is our reaction to those things that creates how we experience our lives. Our quest is to widen the gap between the stimulus and the response so we are not reacting to life, but responding to it instead (page 40). So, when the next "chaotic" event happens in my life, instead of reacting, I'll find my Truth first...and then respond. Isn't that the lesson for today's cards? As for you...on a scale from Chaos to Truth, what is your perception of where you are? Is it time to slow down and tune in? This speaks to me (well, the readings always speak to me, but still...). I have definitely been feeling stuck in the Chaos lately. Between craziness at work, family situations and my own general goals, I've been feeling pretty darn lost. As I drove into work this morning, I started thinking more about how I need to quiet all of the noise in my head and figure out what I'm really wanting out of my life. So, I've been stuck in the Chaos but am finally seeing the need for Truth. Recognizing this will lead me to where I need to be. As always, thanks for the insightfulness, Sheri. It really does enrich my day. I'm not sure I see Chaos and Truth as opposites, or even linear. Because I experience both simultaneously at times. I really love this: "When things feel most chaotic is when it is most important to listen to my truth." That's often when its hardest to stop and listen. Stopping to tune into Truth is so hard for me during Chaos. I can feel the edge of the chaos out there. I have been learning not to get pulled into it when it isn't necessary. yes, chaos seems to be the name of the game lately and it's so easy to get caught up in it if one is not paying attention! thanks for the reminder!!!! My life feels a little out of control since I recently went back to work full time after 10 years. I feel I can't keep all the balls in the air even though I have a lot of help from my hubby. I need to "be still and tune in". Everything is being taken care of it's more my perception. Sheri, thank you as always for getting me back on track.